It seems the animals have formed quite the bond after being brought to Carolina Waterfowl Rescue in Indian Trail. 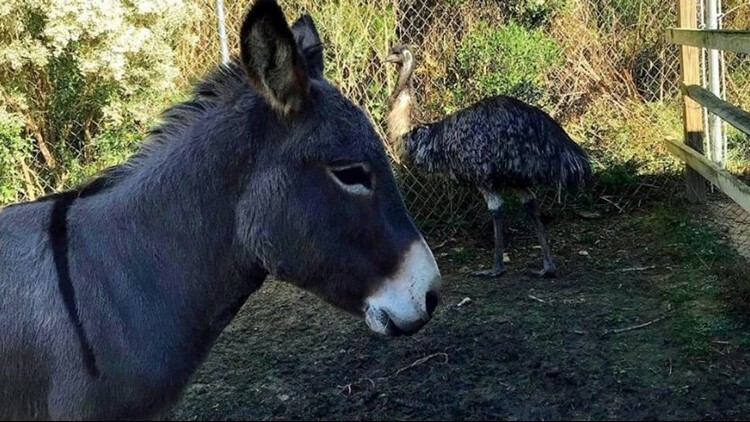 INDIAN TRAIL, N.C. — A donkey and an emu are up for adoption at Carolina Waterfowl Rescue, but there's a catch: They come as a pair. It seems Jack and Diane, as they've been aptly named, have formed quite the bond after being brought to the rescue in Indian Trail. In fact, Jack, the donkey, is a bit jealous and protective when it comes to Diane, the emu. "We tried letting Diane near our emu, Dino, and we struck out again. They are perfectly happy together. Jack does not want any other donkeys near him or Diane. They can't be housed with other donkeys or emus," the rescue's Facebook post read. The couple had many visitors come by on Thursday which wore them out, the rescue said. The animals are not used to a lot of human contact, and they're still getting familiar with their surroundings. Anyone interested in adopting Jack and Diane should email questions (and pictures of your farm) to the rescue. Donations are also being accepted as their care is expensive.